We bought our home before I found out I was pregnant with #4. The home had three bedrooms that were perfect for our three kids. I have nothing against sharing rooms, but it just worked out nicely that the house we fell in love with had the perfect space for everyone. But then we found out that baby number four would be arriving a few months after we were able to move in and we had to decide who would be sharing a room. The two boys would be 12 years apart, so that didn't seem like a great option. The two girls have shared a room for as long as there have been two girls and our oldest daughter is the type that really needs her own space. So that left the two youngest sharing a room, at least for a while. We wanted it to be a place that would work for both of them, feel like a fun nursery for the baby without feeling too much like a nursery for our five year old daughter. I have seen some fun themes for a boy and a girl sharing a room, like a princess and dragon theme, but I decided that the best way to fit both of the kids would be to stick to a bright rainbow themed room. I painted the walls white and bought some fun red dressers. A rainbow colored theme would allow for the blue and green that I wanted to use for the boy to marry with the yellow and purple that Ruby wanted to use. I have never successfully completed a room before the arrival of a baby, and this time is no exception. I did manage to get it painted and all of the furniture in place before he made his appearance though. From here on out it is just the fun stuff, the accessories. There are a few things you won't find in my nursery though. We are lucky to have a play room, so you won't find any games or toys in the nursery. Especially because it is a shared space, it keeps the room uncluttered and I don't have to worry about stepping on any stray toys in the dark when I come in to get the baby in the middle of the night. You also won't find a full crib set. I buy fitted sheets for the crib, but avoid the pillows, quilts, bumpers and coordinating diaper holders. The 'extras' all become hazards for the baby during different developmental stages and I found with my first three kids that I never used the diaper holder. Now what I do love is a cute coordinating dust ruffle because the space under the crib then becomes a great hidden storage space for the stash of unopened diapers and wipes that you have accumulated. You also won't find a changing table in my nursery. If you want a changing space, consider buying a changing pad that is meant to use on a dresser. I personally use a changing pad in whatever room I happen to be in at the time, which right now is usually my bedroom since that is where he is sleeping at the moment. A changing table, in my opinion, takes up too much space and isn't used long enough to make the purchase worthwhile. By keeping everything simple, the room will be easy to update with things they like as they grow older and even switch out roommates later without having to overhaul and redo a room that is too baby themed. Plus, I love color, so it makes me happy! Tell me about your nursery. What are your best tips for what you do and don't need when setting up a space for baby? I agree with keeping a nursery simple. There is so much hype about babies needing so many material things. Don't waste your money, and your family & friends' money. I learned with our 1st child that you don't use 1/2 the stuff you think you need, like the changing table and bedding. More than not, I found myself changing the baby in whatever room we were already in. We kept our 3rd, and last, child's nursery super simple. I had already gotten rid of the bedding, and stuck with just a receiving blanket and a fitted sheet. We also painted the room with yellow and blue stripes. 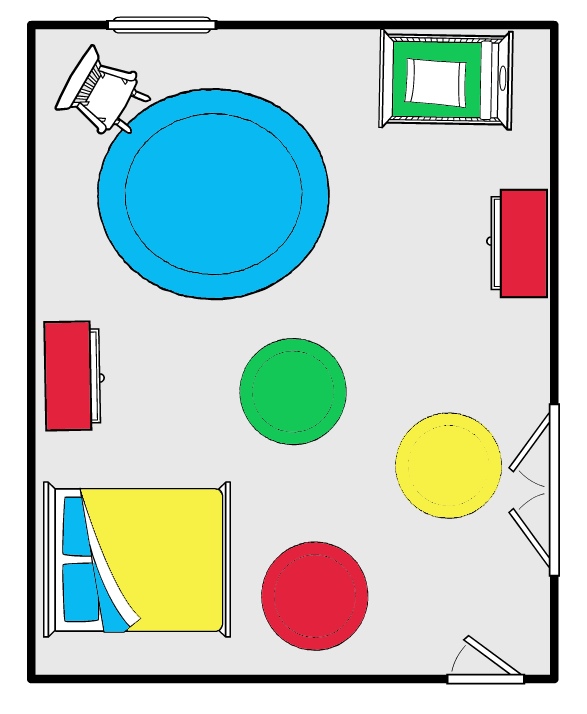 Now, when I move the 3rd in with the 2nd, the nursery can easily convert to the playroom. Great post. Very helpful. Keep up the good work. I'm following now.